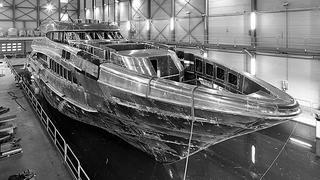 In early December, the hull and superstructure of the new Project Azuro were joined together at Heesen Yachts. Also known as hull number 16650, Azuro is the fourth hull of the successful 50 metre all-aluminium series begun in 2011 with the launch of Satori and the hull 15850. Like her predecessors, the 49.8m motor yacht Project Azuro is designed by Omega Architects with naval architecture by the duo of Heesen and Van Oossanen. The sporty lines in this series won numerous awards, including a 2012 World Superyacht Award for Satori. The interior is designed by Francesco Paszkowski, a first for the Dutch yard. It will accommodate 12 guests in six cabins, including a master suite on the main deck and five double guest cabins on the lower deck (a full-beam VIP, two doubles and two twins). More details will be released in the future. Project Azuro will be powered by twin MTU 16V 4000M73L engines giving a top speed of 23 knots and a range of 3,100 nautical miles at 11 knots. Heesen Yachts has ten yachts under construction to be delivered up to 2015, including the third 50 metre all-aluminium motor yacht (hull 16050) scheduled for 2013 and Project Azuro scheduled for spring 2014.